It is rare to encounter an album that has the potential to alter the trajectory of a genre. 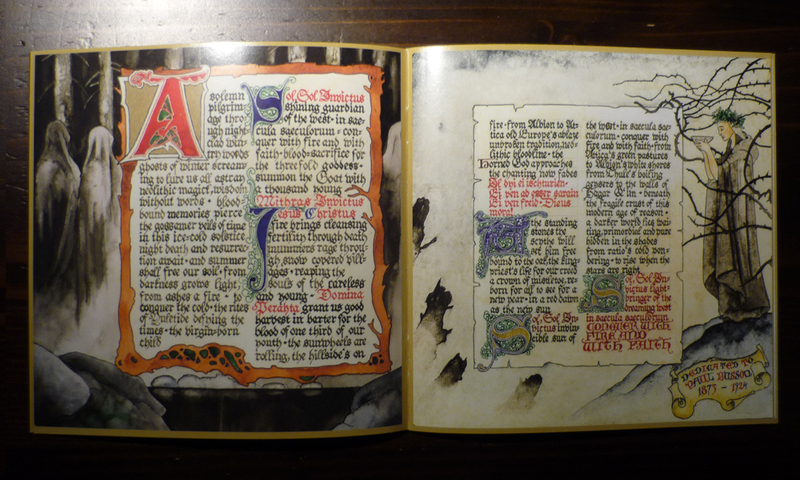 The previous full-length release from Atlantean Kodex – The Golden Bough – was remarkable for its intellectual depth. The title of that record refers to Sir James Frazer’s monumental work of comparative mythology and anthropology of the same name. Published between 1890 and 1915, the final edition ran to twelve volumes. Frazer’s work is a remarkable compilation that – alongside the theories of Marija Gimbutas and Margaret Murray – laid the groundwork for the modern pagan movement, the tropes of folk horror and much of the public understanding of the roots of ancient folk practice. Any time that reference is made to sacrificial kings or ancient fertility rites, the ghost of Frazer is hovering somewhere nearby. It is also true that Frazer’s theories have been utterly discredited by several generations of scholars. 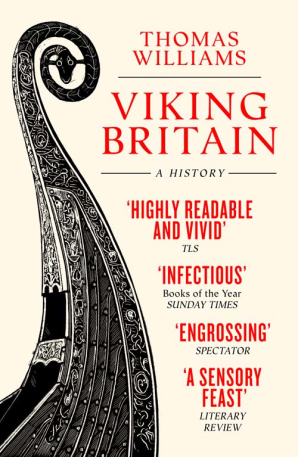 As long ago as 1970, William Chaney’s book Sacral Kingship in Anglo-Saxon England – a work that drew heavy inspiration from Frazerian ideas – was generally ridiculed (unfairly in many cases; it contains a number of fascinating ideas even though the overall thesis is undoubtedly incredible). Atlantean Kodex acknowledged this sullied academic legacy in the sleeve notes to The Golden Bough, but asked the listener to accept the Frazerian legend as a thought-experiment; by leaving rational objections behind, and embracing the dark dream of Europe’s mythic past, the listener was offered the opportunity to reconnect with some of the magic that saturates the heritage of the West. Most interestingly, AK began to weave into this the rich fabric the threads of Christian theology and superstition that have to a great extent defined European culture. The song Temple of Katholic Magic was the first concrete expression of this idea and evokes to extraordinary effect the smell of incense in dark crypts and the splash of coloured light through stained glass windows. This theme is elaborated on with The White Goddess, an album which builds in every way on the foundations of its predecessor. It is particularly important and surprising because, despite the darker emphasis of this album compared to its precursor, it is an inherently optimistic and inclusive vision that AK set out here. Beauty, optimism, melancholy, death, glory, majesty and mystery all have their place on The White Goddess. It is an approach that reveals how myopic and creatively bankrupt much heavy metal that treats of mythological themes has become. It is a fact that the rich seams of myth, history and folklore that AK exploit have generally only been explored in any depth by Black Metal artists, some of whom have responded to this material in profound and sophisticated ways (Enslaved, Negura Bunget, Primordial). But it is also undeniable that Black Metal is defined by a negativity that is deeply limiting in its emotional range and, therefore, damaging to its artistic potential in the long-term. And it is also true that the subject matter has too easily been perverted by this negativity to a poisonous racial nationalism that has compromised otherwise outstanding musical projects (Burzum, Walknut, Nokturnal Mortem). “Sargon [Interviewer]: Your lyrics seem to promote a Pan-European Renaissance and revival. While obviously not specific, this theme does have a lot of resonance today, when many people feel European culture is threatened by immigration and cultural diffusion. Do you agree with that sentiment? A Black Metal artist, constrained by the restrictive parameters of the genre, would rarely if ever feel able to express sentiments like these regardless of personal conviction. Those fiercely policed boundaries are one reason why, despite infantile claims to ‘trueness’, much of the Black Metal pose, as embodied by Euronymous and those who followed, is dishonest and self-deluding. To encounter a musician inspired by ancient European mythology and folklore who can speak intelligently and positively about immigration and tolerance is to hear a fresh breeze in the trees, a cool wind blowing from the Bavarian Alps. The points of reference are still evident (Manowar, Bathory, Solstice), but increased maturity and confidence mean that this release establishes the AK sound as unique and unfettered. Each of the five long songs is artistically distinct, each offering a different emotional perspective on the themes of the album. There is no superfluous material, not a second that has not been thought over and crafted to reflect the band’s vision. The same care extends to the visual presentation. 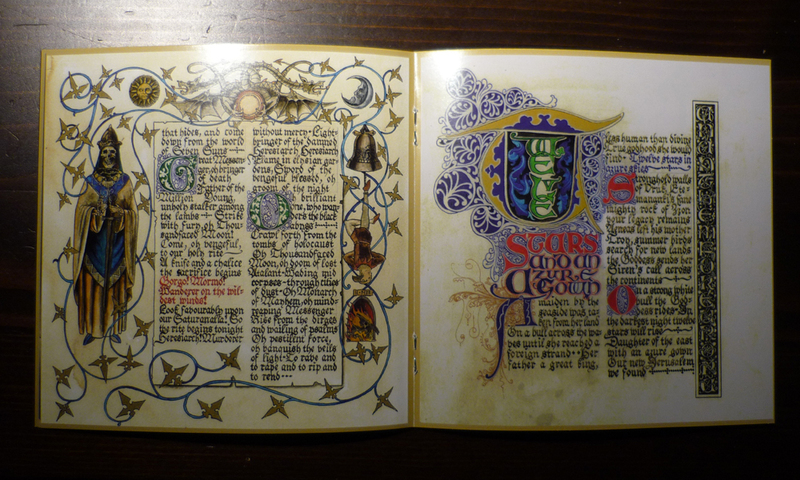 Created by artist Ben Harff, the fully illuminated and hand-drawn booklet is a beautifully crafted artwork in its own right. This is artwork that enriches the music it illustrates in a way that is rarely attempted and almost never achieved. The White Goddess redefines what traditional heavy metal – Epic Metal – can be. It has the potential to do for that genre what In the Nightside Eclipse did for Black Metal, resetting musical, lyrical, aesthetic, intellectual and emotional boundaries. And yet, in every one of these dimensions it remains inescapably and unmistakeably ‘Heavy Metal’. 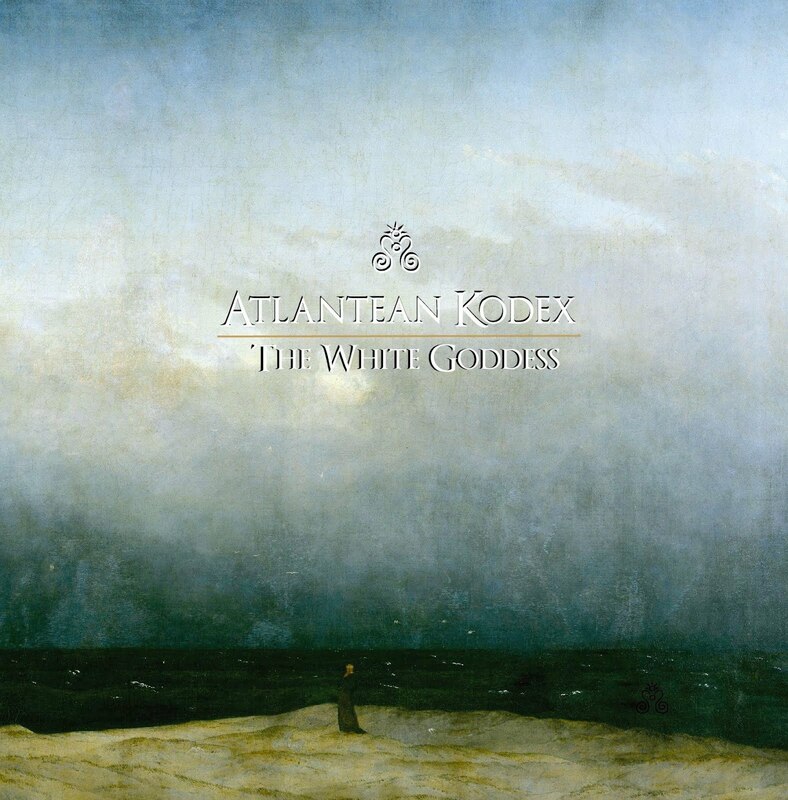 Unlike the post-black-metal phenomenon – whose pioneers have either systematically deconstructed their heavy metal identities out of existence (Alcest), or been left with a rump of heavy metal elements that are at best obsolete and at worst irritating (Agalloch) – Atlantean Kodex have managed with The White Goddess, just as Emperor did with Nightside, to up the atmospheric intensity without changing the game. This is not to say that this shift hasn’t been coming. Bands have been taking their inspiration from early Manowar and Bathory for some time, with increasingly sophisticated imagery – Doomsword, Wotan, Crom, Grand Magus. UK based Solstice have been particularly important for Atlantean Kodex both in sound and in thematic content. The album New Iron Age, in particular, is an overlooked classic that should be recognised as a seminal moment in defining a new Epic Metal. Newly released material is promising. Solstice, however, have proved themselves too erratic, too eccentric and too unproductive to claim the crown for themselves. It is their protégé – Atlantean Kodex – that have pulled together all the threads of this burgeoning scene and crafted an epoch-making release. It is, moreover, an eloquent response to all those who decry traditional heavy metal as crude, naive, laughable and riddled with pubescent fantasies of big muscly guys and their equally anatomically improbable women-folk. This is Heavy Metal for grown-ups; the dawn of a New Iron Age is breaking.